Since the latest update to iOS 7, battery life has become an even bigger problem for iPhone users. As if it wasn’t an issue before, now users are finding the need to charge up multiple times a day! Here are a few tips and tricks to help you get the most out of your iPhone battery when it's on its last legs. Most of what we're going to recommend can be done in the iPhone's "Control Center," which you can access by swiping from the bottom of the screen. 1. Turn down screen brightness. Turning down your iPhone's screen brightness is one of the first things you should do if you're trying to save battery. 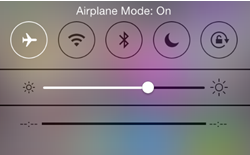 Swipe up to control center or go to Settings>Wallpapers & Brightness>Brightness. 2. Turn off Bluetooth. If you're not connecting to any accessories, turn Bluetooth off. Control Center>blue tooth off. 3. Turn the screen off when you’re not using it. Obvious, but it helps. You can also reduce “Auto-Lock” time so your display turns off after just 1 minute Settings > General>AutoLock>1 minute. 4. Turn off background app refresh. This automatically refreshes an app’s content whenever you’re connected to cellular service or Wi-Fi. 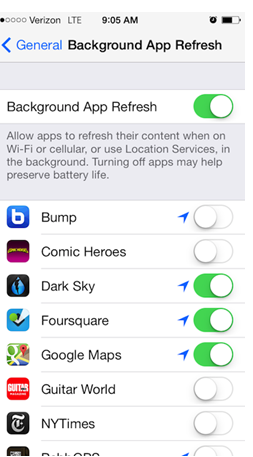 Settings>General>Background App Refresh. 5. Turn off location services. 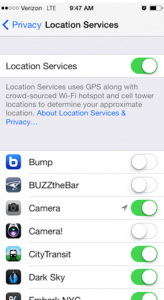 Settings>Privacy>Location Services. From here, you can either turn off this feature entirely by tapping the green switch next to Location Services, or disable it for individual apps by pressing the switch next to each app. 6. Turn WiFi off. Control Center>WiFi Off. 7. Close some background apps. Some apps could be eating through your battery even though they’re not clearly visible. 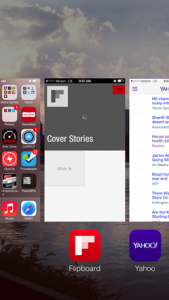 To close background apps, double tap your iPhone’s home button. This will display any apps that are currently open. Dismiss each app by putting your finger on the desired app and swiping up. 8. Disable notifications for as many apps as possible. You can do this by heading over to Settings>Notification Center>Include. 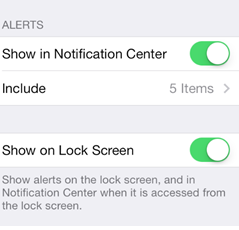 From there, tap on an app and switch off “Show in Notification Center” and “Show on Lock Screen.” This will prevent your phone from pushing unnecessary notifications to your lock screen or Notification Center, which could save some battery life. 9. Turn off AirDrop. This feature lets you share files with other users on the same network. While this can be useful, it also wastes power if it's turned on when you're not using it. 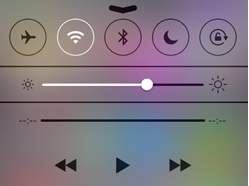 Slide up from the bottom of the screen to reveal the Control Center, tap AirDrop and then press Off. 10. Turn off the Parallax View. This could also help preserve your iPhone’s battery. Parallax View is the feature that makes it look as if your phone’s background is moving when you move the phone from side to side. 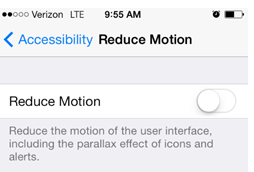 Navigate to Settings>General>Accessibility>Reduce Motion to turn this off. Bonus: Turn on Airplane mode to charge your phone faster. 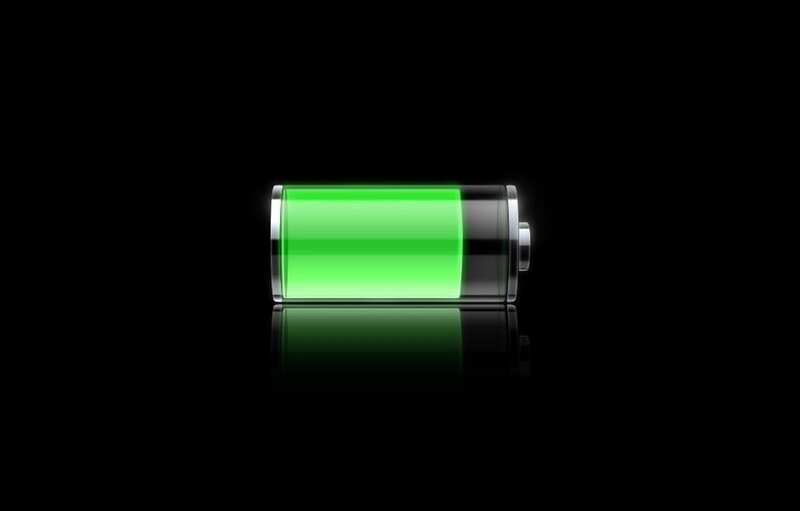 If your iPhone's battery is running low and you've only got a few minutes to charge it up, try turning on Airplane Mode while it's plugged in. This turns off the wireless radios inside your phone, which could enable it to charge faster since it's using less energy.